Flickr's got a new 'stats' feature and it's way too addictive. It allows me to see that 4 people in the last week have googled "Sun Burn Remedy" or something close on google images and then clicked through to my goofy lobster face. "One snorkelling trip lasted longer than expected and resulted in nasty sunburns. 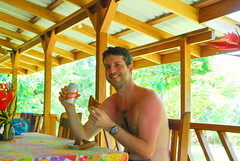 Here I am trying a homeopathic cure for sunburn - beer and grilled cheese." What Are Your Solstice Plans?